Come along for a breathtaking dawn or dusk cruise. Head out on a sightseeing cruise to view the Queen Mary 2 or Queen Elizabeth at the calm of dawn or in the golden glow of dusk on a spectacular cruise with Afloat Cruises International. Get up close to the majestic Queen Mary 2 or Queen Elizabeth, Cunard’s most magnificent transatlantic cruise liners, regularly making trips to around the globe and offering their passengers the ultimate in luxury. Sip a glass of bubbly, wine, beer, tea or coffee while you see the sights. 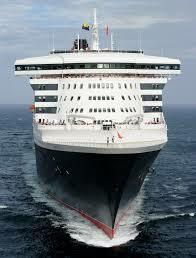 Enjoy a 2.5 or 3hr dawn cruise to welcome Cunard’s finest ships into port. Cruise Breakfast menus include: Quiche(Vegetarian & Bacon), Breakfast Sausages, Hash Browns, Mixed Muffins and Fruit platters. Complimentary glass of bubbly, wine, beer, tea or coffee. Customers are advised to seek refunds from the purchasing agent. 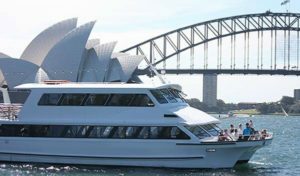 Enjoy a 2.5hr dusk cruise to see off Cunard’s finest ship out of Sydney’s Darling Harbour. Dusk Cruise evening menus include: Roast Chicken, Veg Tomato & Basil Penne Pasta, Garlic Roasted Potatoes, Garden Salads, Bread Sticks, Assorted cakes, Mixed Muffins and Fruit Platters.